Anthropogenic greenhouse gas emissions are changing the Earth’s climate and impose substantial risks for current and future generations. What are scientifically sound, economically viable, and ethically defendable strategies to manage these climate risks? Ratified international agreements call for a reduction of greenhouse gas emissions to avoid dangerous anthropogenic interference with the climate system. Recent proposals, however, call for a different approach: to geoengineer climate by injecting aerosol precursors into the stratosphere. Published economic studies typically neglect the risks of aerosol geoengineering due to (i) the potential for a failure to sustain the aerosol forcing and (ii) the negative impacts associated with the aerosol forcing. 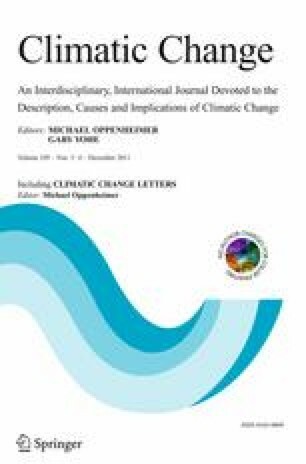 Here we use a simple integrated assessment model of climate change to analyze potential economic impacts of aerosol geoengineering strategies over a wide range of uncertain parameters such as climate sensitivity, the economic damages due to climate change, and the economic damages due to aerosol geoengineering forcing. The simplicity of the model provides the advantages of parsimony and transparency, but it also imposes severe caveats on the interpretation of the results. For example, the analysis is based on a globally aggregated model and is hence silent on intragenerational distribution of costs and benefits. In addition, the analysis neglects the effects of learning and has a very simplistic representation of climate change impacts. Our analysis suggests three main conclusions. First, substituting aerosol geoengineering for CO2 abatement can be an economically ineffective strategy. One key to this finding is that a failure to sustain the aerosol forcing can lead to sizeable and abrupt climatic changes. The monetary damages due to such a discontinuous aerosol geoengineering can dominate the cost-benefit analysis because the monetary damages of climate change are expected to increase with the rate of change. Second, the relative contribution of aerosol geoengineering to an economically optimal portfolio hinges critically on, thus far, deeply uncertain estimates of the damages due to aerosol forcing. Even if we assume that aerosol forcing could be deployed continuously, the aerosol geoengineering does not considerably displace CO2 abatement in the simple economic optimal growth model until the damages due to the aerosol forcing are rather low. Third, substituting aerosol geoengineering for greenhouse gas emission abatement can fail an ethical test regarding intergenerational justice. Substituting aerosol geoengineering for greenhouse gas emissions abatements constitutes a conscious risk transfer to future generations, in violation of principles of intergenerational justice which demands that present generations should not create benefits for themselves in exchange for burdens on future generations.